In all of our years of boutique guitar building, we’ve learned that our customers share our passion and appreciation for both high-end vintage acoustic and electric guitars. 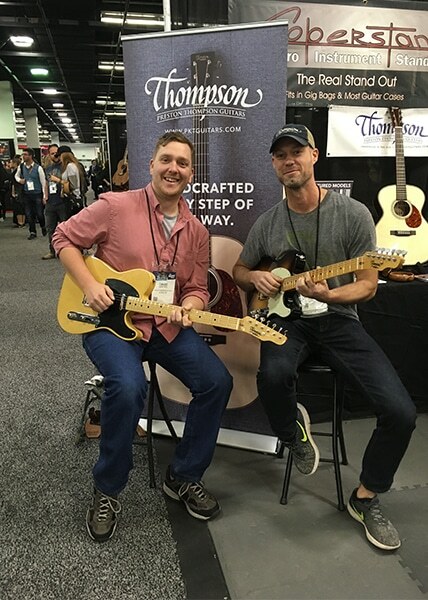 David Peto, one of our lead builders who’s been with Thompson since 2015, regularly chatted with Preston about recreating the original solid body electric guitar from the early 1950’s. The more the idea was discussed, the more interest levels grew and in 2018, talk turned into action. Preston and David worked through a round of prototypes while collecting market feedback from industry vets and the results are in – mission accomplished. Preston Thompson Guitars couldn’t be more excited to offer our new limited run of our (TSM-52) 52 Thompson signature T-style electric guitars. As one of our Thompson offerings, these guitars will be crafted in our custom shop from the highest quality materials and components with unparalleled fit and finish. Please call 541-640-9919 or email chris@thompsonelectrics.com or sales@pktguitars.com for pricing and discuss what makes our TSM-52 a true one-of-a-kind.